Here is my basic curry recipe, best served over sticky rice. Start with a pot of boiling water. Parboil the potatoes and carrots to soften them up before you start the other veggies. I would do this for 3-4 minutes depending on how small the potato is diced. You want the potato to soften up but not start to get mushy. Drain the water. Add all your vegetables and tofu/chicken. Mix the coconut milk and curry paste and pour over vegetables and tofu. Salt/Pepper to taste. I like to have enough liquid to cover most of the vegetables, but no so much that it’s a soup. Think very chunky stew. Turn the heat to medium and let vegetable simmer in the curry for 20 to 30 minutes. It is done once the vegetables are cooked all the way through. Serve over rice. Great as leftovers. I’ll add a picture the next time I make it. Another way to use curry is in something like this Curried Noodle Patties recipe. It’s on my list of things to try. On Monday night I made chicken curry salad to eat over the week for lunch and during class on Tuesday and Thursday nights. 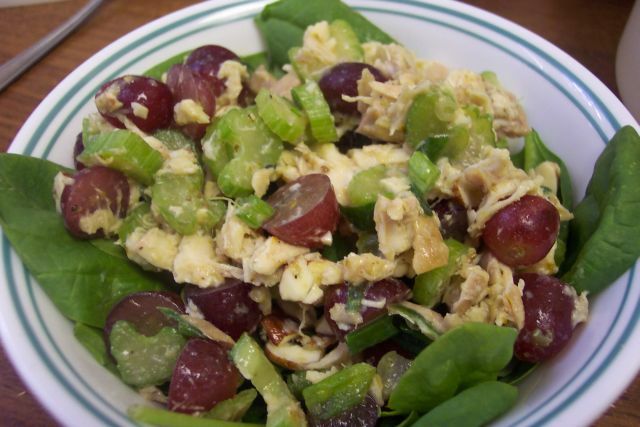 Mix chicken, celery, onion, grapes and almonds. Mix yogurt and curry paste and mix into salad. I used a green curry paste from the Chopping Block, but I imagine curry powder would work about the same. Eat over greens or on toasted bread. Next Times: I’ll toast my almonds first and maybe not mix into the salad until I’m ready to eat. I may also try apples in addition or instead of grapes.